Since finishing the 2014 NaNoWriMo challenge at the end of November, 2014, I've been taking a break from writing and looking for any opportunity to read - which had always been my greatest literary love until writing came along. I have to share my thoughts about Covert Reich - a medical and political thriller - because, despite the varying star levels this book has achieved, A.K. Alexander had me gripped from the horrifying beginning to the heart-pounding conclusion. The story takes places in various settings with a wide cast of characters to color the literary canvas, who have a number of professional backgrounds including politicians, doctors, cops and a journalist who cannot rest when she has the scent of a major story. Though the investigation of medical situations provides the backdrop for the story - young healthy mothers dying during delivery, along with their babies with one exception - I've classified Covert Reich as a political thriller. Why? If not for the political aspirations of certain individuals, these medical situations would not have taken place. Imagine one man with an agenda to rid the world of undesirables and recruiting others to his cause using brute force, emotional blackmail and other means. Imagine young mothers taking prenatal vitamins, only to learn they are taking medication that would spontaneously abort their baby and, because of the addictive properties, they would become infertile. Imagine such a poison being administered to pregnant women and teens across the world because they had the wrong skin color, religious beliefs or sexual orientation. Of course, in the book's premise, this wouldn't happen in "white" society as long as the people were considered the "purest" of the race. Well, I am white. I'm not an American but that doesn't matter because, as I read, I pretended I was living in such a country; the name of the country didn't matter. I would never have been comfortable knowing such a thing was taking place. It's not because my children and grandchildren have mixed blood between Caucasian, Inuit and African descent. It's because, at heart, I'm an emotional being who could never imagine robbing a person of the chance of fulfilling their dreams. That being said, I have witnessed, or heard of, situations which made me wonder why, sometimes, abusive people ended up with children when so many couples, or people who would make wonderful parents, could never conceive. I've never come up with an answer to the question and had to stop asking it because it was beginning to drive me crazy. In the end, I have no control of these things and may never understand why things happens as they do - why some people have such terrible upbringings while others are raised with love, even if there is not an abundance of money in the home. All I am sure of is that there is a reason behind everything that happens and good can always come from bad situations. Moving back to Covert Reich, after reading stories such as this one, it makes me wonder about all I don't know that may go on behind closed political doors. I've often been content to trust in the system but, sometimes, I have to wonder if I'm just naive, whether I should feel as relaxed as I do. If you want to read a story that will take you on a suspenseful, whirlwind trip to many places around the world, a book that will have your heart pounding, even stopping on occasion, this is a book you'll want to add to your bookshelf. 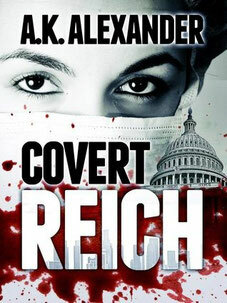 I bought Covert Reich in March of 2012 and am sorry I only got to reading it now. If you are interested in learning more about the book, just click on the book cover above and you will be taken to the book's page on Amazon. I will definitely read other works by this author who also publishes books under her real name, Michele Scott.